Reason and Intention - Bunyoro-Kitara Kingdom (Rep. Uganda) - The most powerful Kingdom in East Africa! As regards to environment, forests in the Kingdom have been depleted by the people in the areas. Bunyoro Kitara Kingdom was known as a green belt Kingdom with heavy forests and forest reserves all around, but due to increased demand for fuel and other economic activities as a result of increased population has caused deforestation in the Kingdom. In the financial year 2010/2011 Bunyoro Kitara kingdom came up with a strategic plan of establishing nursery beds in its 265 perishes, intending to facilitate tree planting in the region. However establishing the nursery beds for trees only is not enough to encourage people to involve in tree planting in the kingdom. Therefore the Kingdom have decided to involve itself in the actual practice of planting the trees in the region were by planting trees for timber and those which bear fruits. 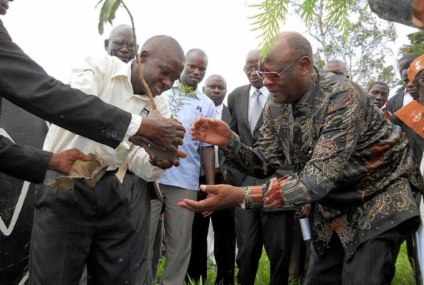 The Kingdom is planning to plant trees and re-forestation in areas of Musaija Mukuru, Rwampanga, Kibaale, Masindi–Port and Musoma as a strategy to conserve the environment starting with 100 acres in this year 2011. The Kingdom will plant commercial spices of Cypress, Musizi, Nkalati, Mvule, Pine, Emitoma, and Eucalyptus, on other hand of fruit bearing trees, the Kingdom will plant Jackfruits, avocados Trees, and orange trees etc. In order for the Kingdom attained improved environmental changes, it will involve itself, and sensitize the public about the importance of tree planting and using forests in a more friendly manner to benefit out of the existence. The challenge to the Kingdom is how to sustain these forests and trees that will be planted in the kingdom. HM the Omukama planted trees. Conserving the environment to avoid global warming in the Kingdom that will increase on the amounts of rain fall in the area and reduce on the temperatures that will enable increased output of agriculture products in the area thus increasing the standard of living for the Kingdom subjects. Poverty reduction in the Kingdom, as people get involved in commercial tree planting will increase their incomes i.e. sale of Timber from Cypress, Musizi, Mvule, Emitoma, and Eucalyptus. Thus a number of people will be employed in related activities such as transportation, sawing and manufacturing. Increased food production in the Kingdom, as we plant trees, i.e. fruit bearing trees, like Jack fruits, and Avocados, people will be enjoying the fruits at the same time conserving the environment. And the climate become more conducive as a result of tree planting in the kingdom, food production levels of beans, maize, onions, Irish potatoes, sweet potatoes, bananas, Soya beans, Cassava, etc will increase due to good environmental climate that will be in the Kingdom. Supporting Government efforts, The government of Uganda is putting efforts towards conserving the environment by calling on people to start planting private forests and conserving the government forests and there reserves, thus when the Kingdom embrace the project of planting, it will be fulfilling the Governments plans of conserving the environment. Cooling ground temperatures and sheltering from direct sunlight allows food crops and other growth to return where they otherwise could not grow. Trees provide organic fertilizers, through the felling of their leaves. Trees will create microclimate conditions for life to flourish, provide home to wild animals, tree roots reduce water erosion, provide medicines and act as tourism attraction. Employment for agricultural workers and foresters. The project will change the Bunyoro Kitara Kingdom in a new world by improving the environmental climate, provide employment , increase peoples incomes and standard of living, increase the food production due to improved weather conditions, manufacturing and increased foreign exchange which is very necessary for development. Therefore when facilitation for tree planting is secured will enable the Kingdom to realize its dreams and attain its objectives of conserving the environment.